I ate some colorful, sharp berries. They are very strange. I have mentioned how strange they are on numerous occasions. How they look approachable but foster dens of shouting and unpleasantness. How they have accessible dumpster locations that seem terrific until the shouting begins. How there is just so much shouting at them. I do not like the shouting, obviously, but that has never stopped me from approaching and exploring human caves. There are just too many reasons to engage with human caves to avoid them completely, so I found myself very close to one very recently. This time it was what appeared to be a collection of very expressive berries that brought me to this human cave. I was wandering around the forest, searching for food and nice rocks when the shine of a bush by a human cave caught my eye. It was so bright. So hypnotic. So enticing. I approached it with caution (as I always do with human caves), but no amount of apprehension could keep me from getting to these strange little bright berries on this bush. They blinked. Quickly and without reason. I had to see them up close. When I got to the bush, I sniffed the bright little things. They smelled like the bush itself, which was odd. I had assumed that shiny berries would have a special, shiny scent to them, but they did not. I then decided to lick the berries. Again, they tasted like the scrawny, bare limbs of the plant they rested upon. They were warm, though. As my nose got closer and closer to a single one, I felt its warmth. I wanted that warmth all over my fur. I wanted to bury myself into the bare twigs of the bush and bask in the warmth of these strange little berries. So I climbed into the bush and let my weight plunge into the tiny, warm berries. It felt nice. So I napped there for a bit. I have no idea how long, but no human shouting ever tried to stop me, so I felt no rush to sprint away from where I was. When I did wake up, I studied the berries again. Scentless but warm. Bright and oddly pointy. I had to know what they tasted like. So, I nibbled on a bright green one. Its soothing hue blinked against my tongue and cheek. I must have had a green mouth for a brief moment. That was probably interesting to see. Anyway, I bit the little thing. And then these berries were suddenly not so great or warm or pleasant. They hurt. Tiny, sharp bits of glass covered my mouth. I spit it out as best I could, but the shattered chunks of the angry berry were all around my teeth and saliva. I did what I thought I had to do: I ran away. It did not help, but it felt right. It was the first time something other than shouting drove me away from a human cave. These berries were likely just defending themselves (something I had never seen before), so I can only get but so upset with what happened. My mouth still hurts, but at least I got to be warm and green-mouthed. 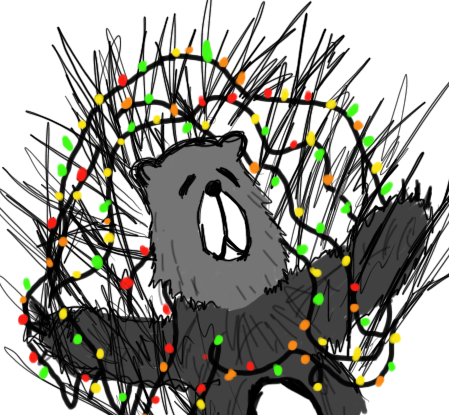 This entry was posted in Bear thoughts and tagged @a_single_bear, bears, bushes, but I ate them, don't eat them, food, green lights, holiday lights, humor, lights, nature, okay, twitter on December 20, 2016 by A bear.